If a region’s farms were to lose the free labor they rely on, what could we do to keep crops growing—and how much would new methods change the way we eat? Last week, the U.S. Fish and Wildlife Service (USFWS) announced that the rusty patched bumble bee would be protected as endangered. It was a swift conclusion to a petition and information-gathering process that lasted over three years and wrapped up this past November. The protection will help this particular bee, but it also underscores the fact that a once-abundant species is now in critical danger. Today, there are 87 percent fewer rusty patched bumble bees than there were in the late 1990s. That precipitous decline–which has put the species on the teetering edge of extinction–represents the much bigger issue we face: all sorts of bee species are in trouble. They are disappearing quietly without much recognition by the general public. And that may have serious implications for the global food supply. Wholesale extinction isn’t exactly the right way to think about the issue. While wind-pollinated crops like corn and other grains certainly dominate the global crop scene in terms of volume, research suggests that up to 75 percent of the world’s major food crop varieties rely to some extent on the exchange of pollen by insects and other animals. And these pollinator-dependent food crops are the ones that provide significant amounts of the micronutrients the human body needs to function correctly. Nearly 60 percent of the fruits Americans eat are largely or entirely dependent on bees; their production would be severely impacted by the continued loss of species. It’s unlikely that all of the world’s 20,000 bee species will go extinct. But wholesale extinction isn’t exactly the right way to think about the issue. What we’re really at risk of losing is diversity. And that’s important because, in every ecosystem, bees and other species work together to keep crops pollinated. It’s these individual “pollination networks” that could be in danger as individual species fade. There are already signs of dramatic decline, at least in some parts of the country: A study of one network in the Midwest, for instance, found a 50 percent drop in bee-flower relationships since around 1900. It’s worth asking: if a pollination network collapses, what would our options be? If a region’s farms were to lose the free labor they rely on, what could we do to keep crops growing—and how much would new methods change the way we eat? Here are four possible scenarios. In order to understand how bees impact the food system, it’s helpful to use a human metaphor. Think about pollination networks like a grocery store, where workers place product orders, stock the shelves, ring on registers, answer phones. It might not make much of a difference if one or two employees don’t show up for work. But eventually, as more and more disappear, the flow of goods and services you rely on will be disrupted. But just like in the workplace, not all those pollinators have the same influence. 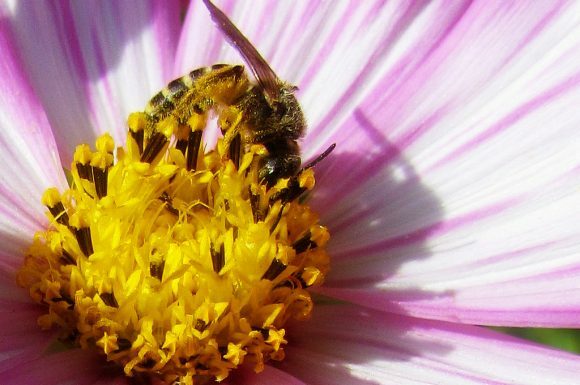 Scientists classify the pollinators on a spectrum from “specialized” to “generalized,” with most generalized species being connected to a large number of plant varieties—like jack-of-all-trades employees who can work any department in the store. Bumble bees tend to be the most highly connected and effective pollinators in an ecosystem—the perennial Most Valuable Employees. Resilience is not happening at the same rate as the loss. Extinction simulations that were run on two historically well-documented pollination networks in Colorado and Illinois found those ecosystems could be fairly tolerant of the disappearance of both specialist and generalist species. Pollinators outnumbered the plant species by three times, and less than 20 percent of the plants in either network were dependent on only a single visiting insect species—so there was room to lose a few. Additional real-world research has demonstrated that new relationships form between different bees and flowers when other species have disappeared from the environment. But remember the study that found 50 percent of the bee-flower relationships had disappeared since 1900? We are losing ground; resilience is not developing at the same rate as the loss. That could be, in part, because of the struggles faced by bees. Extinction simulations show that ecosystems are far less tolerant to extinction when the species being lost have connections to many different plants: the way bumble bees, leaf-cutting bees, mining bees, plasterer bees, sweat bees, and honey bees are. Not only is the world’s grocery store losing more staff than the remaining workers can cover for, it’s also losing its most dynamic workers. In almond orchards, honey bees have been shown to be more effective and almond production to be greater when mining bees and blue orchard bees are present. Here’s the important thing to understand about the role some bees seem to play in pollination networks: they change how effectively other species pollinate. In almond orchards, honey bees have been shown to be more effective and almond production to be greater when mining bees and blue orchard bees are present. That’s because the presence of these wild bees actually force the honey bees to move between flowers more frequently and in different patterns. Similarly, sunflower seed production has been shown to be five times greater in fields that were located near natural wild bee habitat and when native bees were present among the sunflowers. This increased production was the result of both direct pollination by the wild bees and the fact that they keep the managed honey bees hustling from one flower to the next. A pollination network is more than just the sum of its parts. So while other species might be able to take over the relationships broken by extinction, there’s no guarantee that the overall quality will ever be quite the same without the bees. As any grocery store manager can tell you, there are some people on your sales team who simply make the entire team better. Replacing them is not just a matter of hiring a few more warm bodies. When a bee has gone completely extinct within a particular ecosystem, that doesn’t mean it’s gone for good. In some cases, it can be possible to introduce the same species from somewhere else in the world. That’s what happened with the short-haired bumble bee after it disappeared from the United Kingdom. Last observed in 1988 and officially declared extinct in 2000, a partnership of conservationists started their effort to reintroduce the species back to the English countryside in 2009. At first they looked to New Zealand, where colonists had imported the short-haired bumble bee to pollinate the fields of red clover they used to feed their livestock (red clover did not fit into the native pollination networks and was not producing seed). But these first attempts were unsuccessful because the New Zealand queens lacked genetic diversity as a result of inbreeding. In 2011, the partnership focused on a population of short-haired bumble bees in Sweden that were genetically robust and from a region that was similar in climate to the UK. A year later, the first short-haired queens were released into fields of wildflowers around Kent that had been purposely cultivated to support the return of the bee. And, every spring since, additional queens from Sweden have been collected and released. While it’s not yet possible to declare this effort a “victory,” the reintroduction project has shown three years of queens successfully nesting and producing workers. If nothing else, it’s an auspicious start. The tempting comparison to make is that reintroduction is like hiring new staff. However, it’s not quite that simple. As the short-haired bumble bee clearly shows, it’s not enough to simply find the same species and bring it back “home”; you have to be highly selective. And what about species like the rusty-patched bumble bee, which don’t exist anywhere else? Once a network of pollinators collapses, human labor can theoretically step in to replace it. But this is not an ideal scenario. It’s the retail equivalent of designing, building, and deploying robots to replace a workforce. “There are already places in the world where pollination is inadequate, and in desperation farmers turn to pollinating by hand,” says Dave Goulson, founder of the Bumblebee Conservation Trust, and a professor of bumble bee biology at Sussex University in the UK. As you might guess, though, bees are far better at pollinating than people. “This approach is enormously labor intensive,” Goulson says. The farmers have been forced to abandon apples, in large part, because of the unsustainable costs involved with continued hand pollination. Just ask the apple farmers of China’s Maoxian county, who were forced to hire laborers to pollinate their orchards by hand after heavy pesticide use, shrinking habitat, and changes in local weather patterns decimated the pollinator population. Even managed honey bee colonies could not fill the gaps because local pesticide use had killed too many of the colonies. Ultimately, the farmers have been forced to abandon apples, in large part because of the unsustainable costs involved with continued hand pollination. It’s not that hand pollination is impossible, though. There are currently two crops in our modern world that are largely, if not exclusively, pollinated by hand: Vanilla, predominantly grown in Madagascar, Indonesia, and China, is far removed from its Mexican origins—and the two bee species thought to pollinate the orchid in the wild. (This one and this one.) Similarly, cherimoya, a fruit that originated in Ecuador and Peru, is now grown around the world, far away from the beetle species that naturally pollinate it. In California, cherimoya orchards around San Diego require hand pollination (though, farther north, rove beetles have stepped in). While vanilla and cherimoya are both important crops to the farmers and communities that produce them, they are not high-volume cornerstones of our food system. So the real question is whether or not hand pollination could scale up to meet the needs of the apple or almond or squash industries. Would it be worth the time, effort, and cost involved? And what would we eat in the meantime? If, ultimately, pollination networks become completely disrupted as a result of bee extinction, the only choice may be to change the way we eat. One study has estimated the total economic impact to the United States at $15 billion. Fruits would be hardest hit, since many common varieties are heavily dependent on bees for pollination. Several common nuts and vegetables would also be affected. And worse than the loss of choice would be the loss of access to a range of key nutrients that we need: vitamin A, vitamin C, lycopene, antioxidants, and folic acid, as well as plant-based calcium and fluoride. Wind-pollinated crops like corn and other grains might be able to fill us with calories, but could not make up for nutrient loss. Just for good measure, let’s also consider the economic impact the loss of these foods could have on our national economy. The varieties that would be affected by bee extinction here in the U.S. currently make up around 36 percent of the total acreage of fruits and nuts produced in our country. One study has estimated the total economic impact to the United States at $15 billion. And here’s something for the carnivores to consider: what might the potential impact be on meat production in the U.S. if we lose pollination services to hay and other forage for livestock? No matter how you look at it, the continued loss of bees is going to hurt. Period. The global population is expected to increase over 30 percent—from 7.3 billion to 9.7 billion—by 2050. If we return to our metaphorical grocery store, that means not only are the workers leaving, there are now dramatically more customers coming through the door. And this increase in population is also driving a massive increase in demand for foods that are pollinator-dependent. We already know that pollinators aren’t increasing at the same rate as the population. Let’s agree that bees are the indispensable employees of the global food system, hardworking, versatile, and dependable. And human beings are more than just consumers—we’re managers, too. It’s up to us to decide how much we value the free labor bees provide, whether our approach to agriculture will support their work or remain indifferent to it. The question remains: what kind of managers will we be?